I've gotten to see some beautiful birds on my lunch breaks and our hikes around the Ormond Wetlands, but this has got to be one of the highpoints of my new birdwatching sightings! 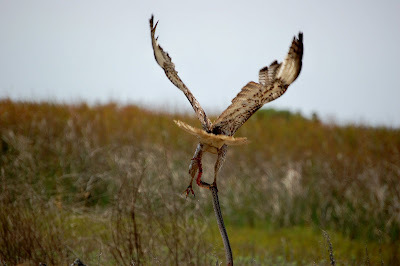 After eating my lunch in the parking lot, I walked down to the water and ran into a man who told me he had watched the hawk catch a snake so big the snake had wrapped around the bird's legs and body. 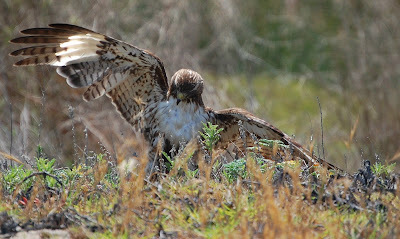 He hadn't been sure who was going to win the battle, but by the time I discovered the hawk on my walk, it had bitten the snake's head off and was using its feet to stop the snake's body from continuing to move. 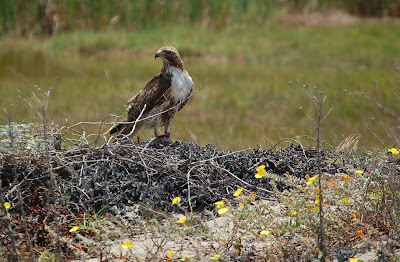 From my vantage point of about twenty-five feet away, the hawk looked to be about 20"-24" tall. The Nikkor 55-200mm digital lens really did the job of catching the beauty and power of this bird! I got a few different shots as I walked by and as the bird took his meal to a couple of different places. 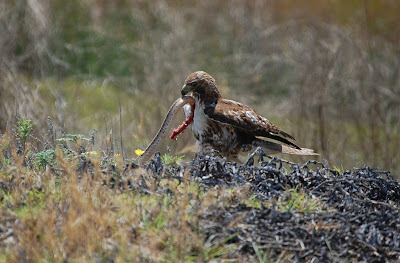 Once it started skinning the snake, I went back to work and left the hawk to eat its meal. Click on the photos to enlarge them; click on the title to see my photo album. Great pics Renata. Send them to Natl Geo!